One of my favorite areas to photograph is the American southwest. While the summers can be brutally hot, the spring is a great time to visit. Not only are the temperatures more moderate, the crowds have not yet arrived allowing for quiet reflection. 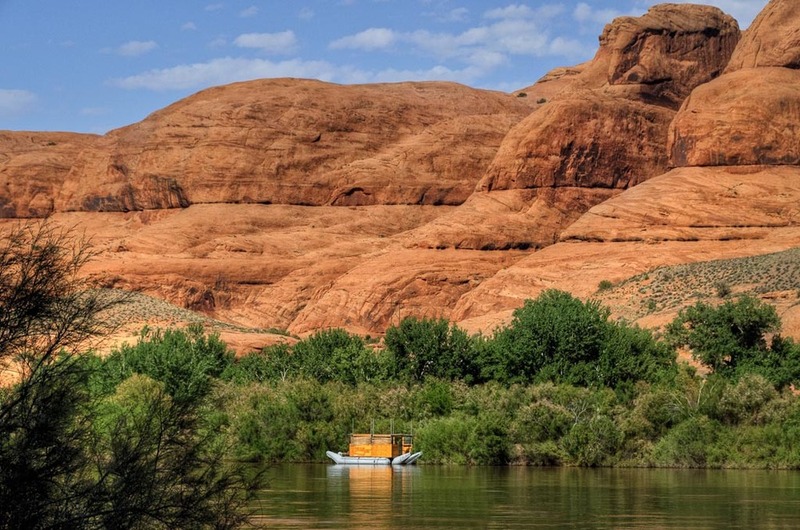 One area, in particular, is the town of Moab, Utah. Situated on the eastern side of the state near Colorado, it is the home base for two national parks (Arches and Canyonlands National Parks) and a great state park (Dead Horse State Park). The Colorado River also runs just outside town. We had spent most of the day in Canyonlands and were driving back into town. I saw the sign for Potash Road and wondered what I might find there (I do this a lot). The road went on for awhile and I quickly realized that we were driving along the Colorado River. Along the way, we discovered numerous petroglyphs on the cliffs where you could pull over and study these ancient drawings. Finally, we reached the end of the road (about 13 miles in) where you can see the cliffs around Dead Horse State Park in the distance. As we turned around to head back into town, I spotted this lone houseboat (the only boat to be seen on the river) and was immediately attracted to the contrast of the little houseboat amid the surrounding towering cliffs. Check out Moab's website to get more information about it's rugged surroundings. And don't forget to explore, you never know what you may find.